Box Hill, north of Dorking, Surrey, is a large area of mixed chalk turf, scrub and woodland renowned for its varied flora. It was where I was first shown how to identify wild flowers and felt privileged to be shown the rarities of the area. Since then (over 40 years ago!!!) I have visited the area regularly and at this time of year a walk almost anywhere is rather like going out to meet old friends. We went for a stroll there the other night supposedly looking for Bee Orchid (Ophrys apifera) at a spot where there are generally plenty but very few this year, we only found a single plant. 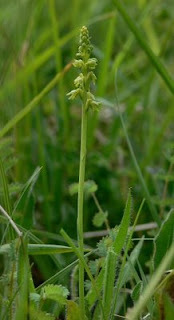 Now it could be a bit early for the Bee Orchid but I suspect not as at the same site we did find Musk Orchid (Herminium monorchis, right) just starting to flower, this must be two weeks earlier than usual, growing at the site I first saw it. 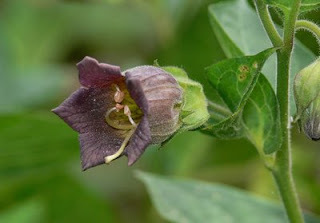 Across the road and there were a small number of plants of Deadly Nightshade (Atropa belladonna, left), within a few feet of where I first saw this species all those years ago. 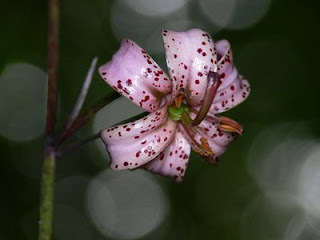 We then moved on, not far, to a wooded area by the River Mole, to look for Turk's Cap Lily Lilium martagon at a site where, according to Lousley's Flora of Surrey, it has been known for little more than 50 years. Only one flower open as yet (below) and roughly the same number of plants as were present when I first saw them. Finally we moved on to another site for the Lily about a mile away where it has been recorded for almost two hundred years , here also it was still in bud but the colony is huge with hundreds of plants spread over quite a large area. It will be a picture within a week or so when the flowers open, especially since there are a good number of white-flowered variants to add a bit of spice. It is nice to meet old friends. A great account of events as they unfold on the hill. I love Box Hill but don't get there very often.